Parents, grandparents, babysitters and more are welcome to bring their children for a relaxed time of fun and conversation. Coffee and treats will be provided, as well as basic toys, games and activities for the kids. 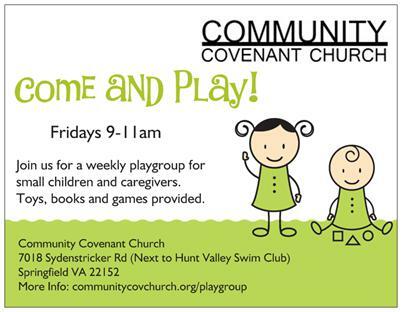 When Fairfax Co. Public Schools are closed for a holiday or the weather, the playgroup will not meet. Playgroup will still meet even if there is a 2 hour delayed start.